I’m bringing you a post about getting a second opinion for your pets which means speaking up for your pets just like you would for your child or anyone else while at the medical facility. I thought this interesting by itself but also because I recently went through this. I have been going to the same veterinary hospital for many years. There are 2 vets there. My Cavalier King Charles Spaniel was limping and barely able to walk around. The first vet said that nothing was broken. She did a blood panel. All internal organs working just fine but one parameter was just a bit out of normal range. It had to do with inflammation. I think the bill was $110.00 and I went away with only the information that she had inflammation problems and maybe it would get better with rest. Two days later she was no better. My wife suggested I take her back. I did and, I saw the other doctor. He did more extensive checks on her legs, hips, knees and neck movement. He also confirmed no breaks but yes, she probably had some soft tissue inflammation issues. He sent me home with an $89.00 bill but, he included an anti-inflammatory/pain reliever medication to be given once a day. It’s a week later and she is back to her old self, running, trotting, bouncing up from a lying position and I am so relieved. If I had pressed the first vet I may have gotten the medication then but I didn’t. It caused my dog three extra days of misery. Here is an article about getting speaking up and getting second opinions for your pet. Enjoy! Fido and Fluffy can’t speak up for themselves, but silence isn’t golden when it comes to advocating for your pet’s health. Let’s face it: Navigating through the often confusing and pricey world of veterinary medicine requires good communication, knowledge, resources – and chutzpah. “You have to know the right questions to ask and not be afraid to ask them,” said Dr. Nancy Kay, a northern California veterinarian and author of “Speaking for Spot,” a how-to guide on how to be your best friend’s medical advocate. The key to success is working with a vet you feel comfortable with, she said, and one who encourages open dialogue and a collaborative approach. After all, no one knows your animal’s antics better than you do. Open communication can also make it less awkward to ask for a second opinion, which can help you make a more informed decision. Advice from a second doctor helped Kristen Edmonds decide against cataract surgery for her senior Siberian Husky, G, who also suffered from a cognitive disorder and didn’t deal well with stress. “The second vet made us feel more comfortable that this may not be the right decision for our dog,” said Edmonds, who rescues Korean Jindos. While many pet owners worry it will dent their vet’s ego, Dr. Arnold Plotnick is never offended when a client seeks a second opinion. Lombard for News | Veterinarian Dr. Arnold Plotnick in his office with a cat patient. He encourages pet owners to get second opinions on their pets. 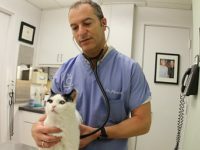 “In fact, I think it is a sign that the client cares so much for their cat that they want to make absolutely certain they’re doing the right thing,” said Plotnick, a board-certified internist and cat specialist, who runs Manhattan Cat Specialists. Asking questions can also help prevent “sticker shock” when you’re handed the bill. A recent study showed that cost is discussed during only 14% of vet visits, and most of the time the client initiates the discussion. Random calls to 10 vet offices around the city showed a routine exam costs about $65, which covers the vet consultation and physical exam – usually toenail clipping, ear cleaning, heart rate and temperature. But any additional tests, such as blood work, feces sample, blood pressure and vaccines will hike up the bill. Still, owners with financial concerns shouldn’t be shy about asking for a printed cost estimate before consenting to any additional tests, Plotnick said. Meanwhile, vaccines are the cause of much controversy, confusion and cost. It’s no longer in your best interest to vaccinate for everything simply because a reminder postcard has arrived in the mailbox. In the past few years, studies have shown that vaccinations last longer than once believed – and some can be harmful. The new rule of thumb is to vaccinate dogs for core vaccines – distemper, parvovirus and rabies – every three years. In some cases, the vaccine effect is life-long, but will vary from dog to dog. A titer test can show how much immunity is still in the blood, but they’re not perfect. Non-core vaccines – such as leptospirosis or bordatella – depend on lifestyle and risk to exposure. That’s why it’s important to work closely with your vet to tailor a vaccine program that considers your pet’s age, lifestyle and risk. For info on vaccinating your cat or dog go to www.healthypet.com. Educating yourself is another key to success, but many vets are irked by misinformation, and warn you not to believe everything you read online. Here’s a tip for finding a reliable online source: Try tacking on “veterinary college” to your Google search for a disease. So you can easily understand why we all need to remember to get as Second Opinion for our pets when it’s warranted which means that you must absolutely Speak up for Your Pets. They have no voice of their own. I always think it is important to get feedback from people that have already used a vet before using them. It is smart to treat taking your pet to the vet just as if you were taking yourself to the doctor. Do the research! Hi “Run from this Place” thank you for your comment. What a great testimonial for the vet hospital. Great website they have too. All the best. I love this place…the doctors are great, the staff of Delbrook Hospital is wonderful and front desk will show your pets so much love and attention! Thats all I need to be sure that my babies are save here. Hello Knee Pain Treatment – Sure you can use it but remember, I got it from someone else and brought their links in so if you use it I suggest you do the right thing too. All the best.